Size: 408 sq.ft. - 1069 sq.ft. Al Haseen Residences is the first of ten residential buildings the developer plans to construct in the Dubai South area. Al Haseen Residences by City Properties is a residential complex that offers a unique lifestyle full of comfort and security to the buyers. The residences offering 3 different typeof plans i.e. "Studio-1Bed-2Bed" apartments that suits different requirements and provide a flexibility that is unique to this project.Each apartment is crafted with an engaging urban design with quality fixtures placed in every corner of the home.From its elegant design residences will surely complement ideal urban lifestyle. The project is currently under construction in the south of Dubai which is expected to be handed over in first quarter 2019. 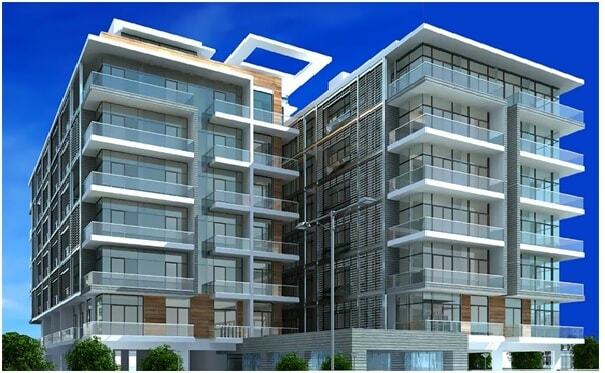 Al Haseen Residences designing studios, 1 & 2 bedrooms stylish homes with a wide range of facilities. Theresidence is a six-story tower coveringtotal 138 units. Studio apartments at Al Haseen Residences are priced at Dh376,200 while 1 bedroom & 2 bedroom apartments costs at Dh739,000 to Dh 880,000.The Unit Sizes are as follows: -* 522 Sq. ft. for Studio Apartments. * 938 sq. ft.for 1 Bed Aparments. * 1,099 sq. ft. for 2 Bed Apartments. Al Haseen Residences offers 3 types of payment plans that suit different requirements and provide a flexibility that is unique to this project. The Al Haseen Residence is conveniently located in Dubai South between two major highways –“the Emirates Road and the Dubai Bypass Road”.Dubai South was previously known as Dubai World Central. This master-planned city centred on the Al Maktoum International Airport, which will become the world’s largest airport in future. DIC is just 15 minutes away from the Jebel Ali port and Free Zone and Dubai World Central International Airport which give easy access for commuters to all these areas. Also Located very close to the famous Expo 20 exhibition site, Abu Dhabi International Airportis 40 minutes driving distance from the project location. The location create easy passageway for people who like to live in Dubai and work in Abu Dhabi. The apartments incorporating all modern amenities such as a swimming pool, separate gymnasiums for men and women, covered parking, central AC and a beautiful waterfall lobby entrance and Meticulously landscaped rooftop garden and many to be added.